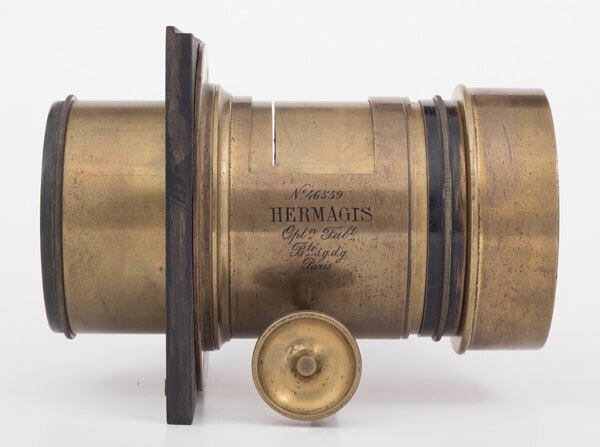 This is a very late Petzval, if one thinks that its conception and first design dates from 1840, when the mathematician Joseph Petzval created it and the company Voigtländer, in Vienna, produced its first sample (see the complete history in this article). 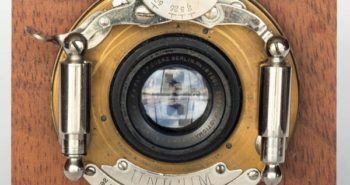 The development of photographic lenses, from the very beginning, took different paths with different objectives. Most obvious of all was to get a lens that could focus on the entire photographic plate with enough brightness to record that image in a very brief instant. This would be a “scientific” lens so to speak, for it would accurately and undistortedly record everything in front of it. The ideal sensitive support for this ideal lens would be a surface without grains or textures that would reproduce, one to one, the same relative brightness values ​​of the photographed objects. It would make a perfect copy of the physical world. Another path, also very important, was that of the images that were called “artistic”. In that case the lens would leave a “signature”, would not give a picture like a mirror, perfect, but would allow some distortion, aberrations and some loss of focus. These characteristics made it the medium of expression for photographers, especially portraitists, who thought their images with an aesthetic vision. They lent some conventions developed in the visual arts and left their clients happy with portraits that resembled some school of painting. It was this type of demand that allowed the design of Petzval to remain in the catalog of the main manufacturers for so many decades and, strictly speaking, continues a type of lens very usable today. It was not “outdated” as it was soon put in a way out of lenses’ technical race. This Objectif for Portrait No. 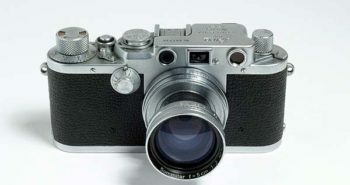 5 is cited as Series I and continued at the beginning of the twentieth century the old Petzval design. Then came a Series II with brighter lenses (between f / 2.7 and f / 3.5). 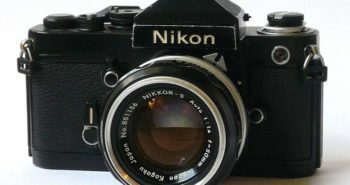 The Series III for portraits has already been the famous Eidoscop, a lens classified as soft-focus. But according to the Vade Mecum, this follows a drawing type RR (rapide rectilineaire) formed then by two symmetrical doublets. Source: Josef Maria Eder, Ausführliches Handbuch der Photographie, 1893 – the arrow shows the light direction. This Hermagis Objectif pour Portrait Nº5 matches the classic design of the first Petzval (above), at least in terms of the sequence of the elements and surface’s curvatures. 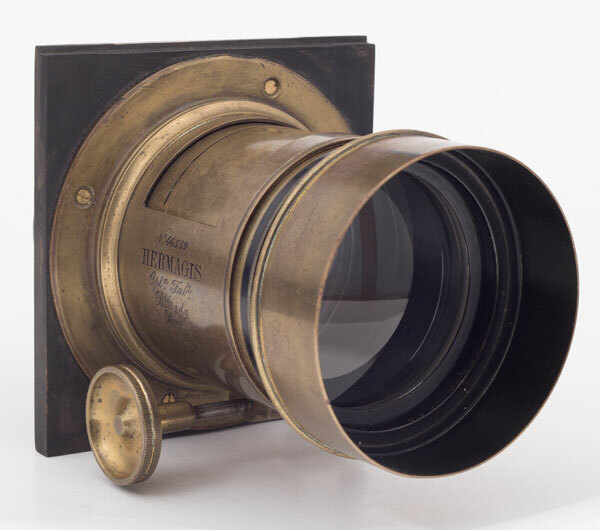 The catalog page reproduced above gives the following specifications for this lens: 31 cm for focal length and, as per image size, it uses a standard format that was very popular in the late nineteenth and early twentieth centuries. 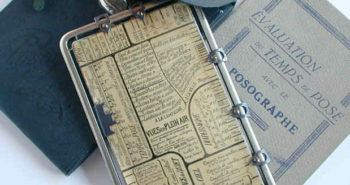 It was called carte-album. However, it is not so easy to be sure today of what it means in centimeters. Henry Baden Pritchard wrote a very instructive book about photographic studios in Europe, in which he says that the carte-album was a roll-out to continental Europe and America, with a different name, of the cabinet format, created in London by Window and Grove studio in Baker Street. To follow that lead we would have to admit the carte-album as 108 by 165 mm ( 4 1⁄4 by 6 1⁄2 inches). 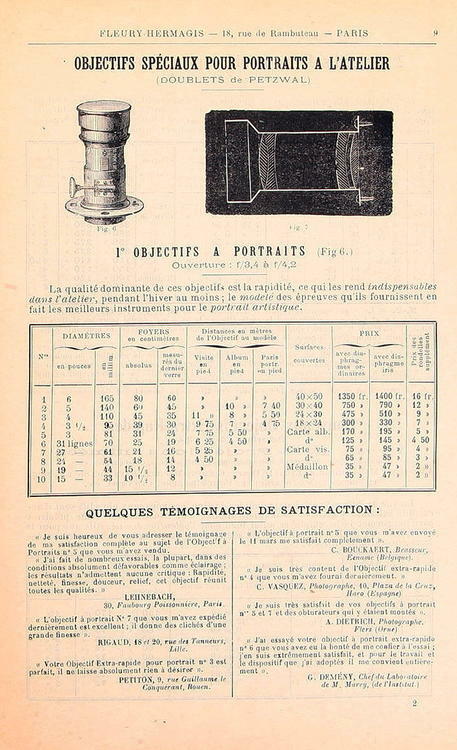 A different account is given by Charles Fabre, in his Traité Encyclopédique from 1890, where, talking about cutting photographic paper for enlargements in standard sizes, he cites carte-album as 10 x 14 cm. As Hermagis and Fabre were both French, I will take Fabre’s view: 10 x 14 cm. This is not so important, but it’s interesting, especially for a Petzval type lens, to know what the manufacturer considered its useful area. Many contemporary photographers, delighted with Bokeh, use these lenses far beyond the manufacturers’ recommendations. Using then 10 x 14 cm, this results in an image circle of 17.20 cm. Using its focal length it gives at a viewing angle of 31 °. Reasonable for a Petzval type lens that normally has a sharp 15 to 20º area, according to Eder in his 1893 Ausführliches Handbuch der Photographie. The surroundings will present its distinctive blur. 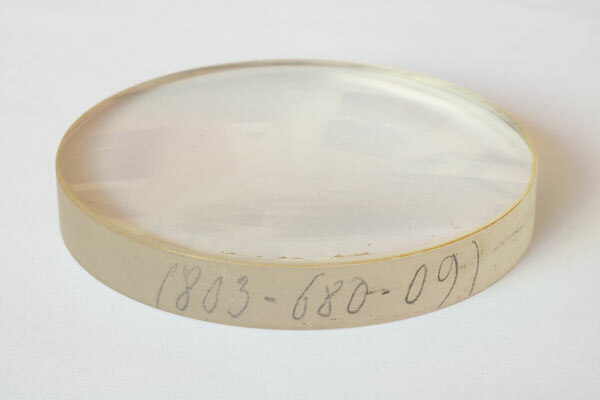 The illumination circle measured on ground glass having the lens without any diaphragm is ~ 26 cm. But the image deteriorates enormously in its periphery. The lens is very large and heavy, if we think about the size of the image it produces. The front element has 80 mm, the flange thread 98 mm and the overall length is 192 mm. It is not possible to mount it on a Linhof Tecknica 13×18 cm and hardly on old field type, folding, wooden and bellows cameras. I have a Thornton Pickard Royal Ruby 18×24 cm and despite the format much larger than the lens’ claim, it simply does not fit in front of the camera. 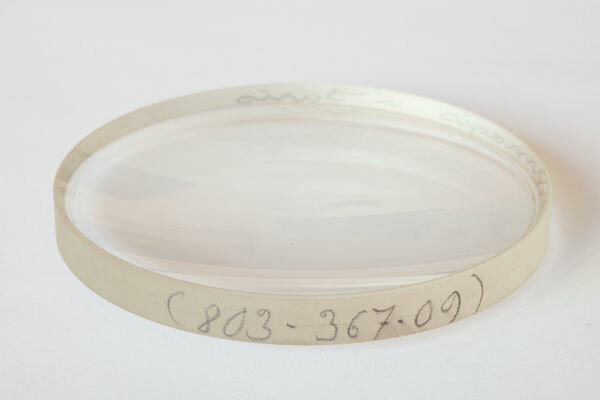 It is therefore really conceived as a studio lens, for those cameras with squared bellows and a generous front to accommodate a lens board of at least 14×14 cm like the one in the picture above. I am building such a camera and hopefully will soon post images made with it. 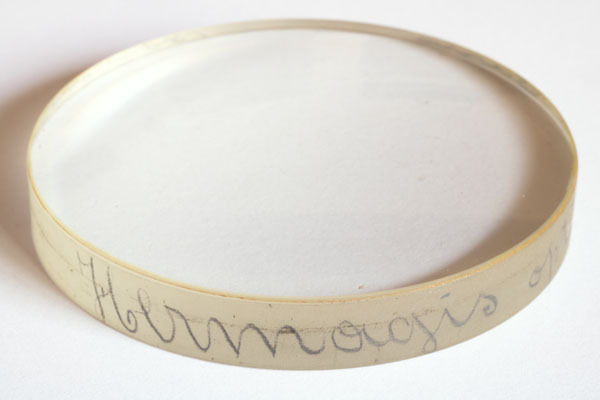 These Petzval type lenses, especially large lenses, are easy to disassemble and usually carry inscriptions written in pencil on the edge of the lenses. 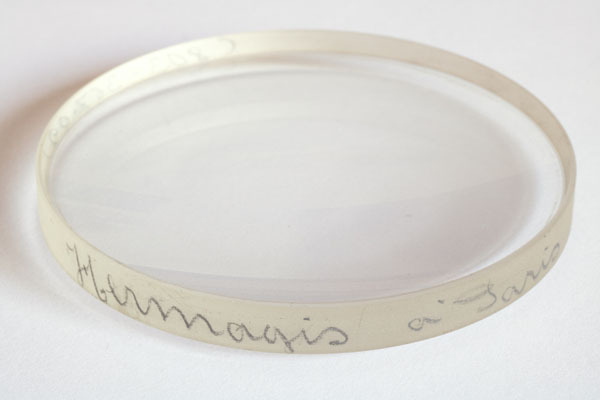 This information is useful in helping to confirm the authenticity of the lens and also, in the case of Hermagis, it is where we can find its manufacturing year. 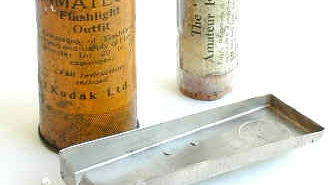 The 09 at the end indicates 1909. This was a practice also observed in nineteenth-century Hermagis lenses. The 803 must be some kind of serialization and the number appearing in the center, possibly the focal length of the element in question. Many of the information I used in this text came from a post I made at the Large Format Photography Forum asking for help and would like to thank the members who collaborated. To see the post and the conversation, access this link.